Hello Los Angeles! 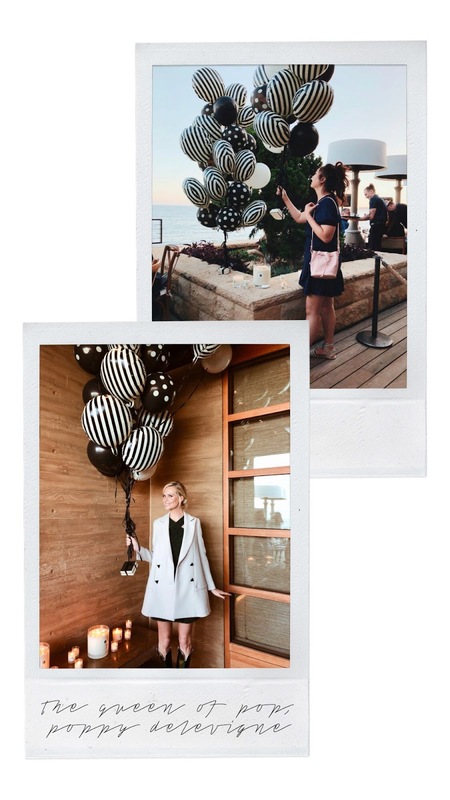 I flew into LAX Memorial Day to spend the week with my Jo Malone London family. After checking into the hotel, I unwinded and treated myself to a relaxing bath using Red Roses Bath Oil. I felt like I was a bed of roses, such a feminine and luxurious bath oil that makes my skin glow after a hot bath. The fun started with a candlelit dinner at the Chateau Marmont with a gorgeous overlooking view of LA. The dinner was hosted by the It girl, Poppy Delevingne, in celebration of her new limited edition Queen of Pop collection with Jo Malone London. It’s always a treat to catch up with familiar faces and dine with inspiring people. I spent the rest of the night admiring the beautifully decorated space, from the classic Lime Basil & Mandarin candles lined up in the hallway to the pretty, assorted blooms at the dinner table. 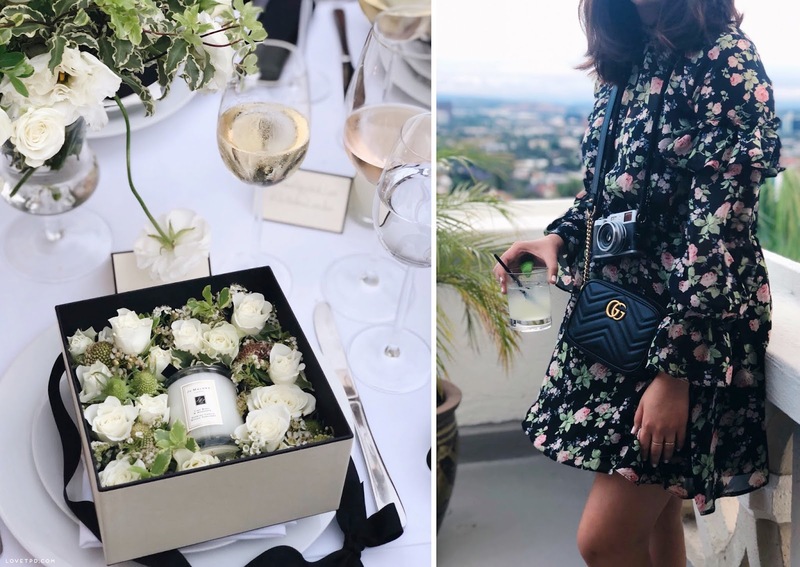 Jo Malone London always throws the best get togethers! It was another pinch me moment! You can read about my first trip to London with Jo Malone London here and here. The next day was the sneak peek of the Poppy Delevingne x Jo Malone London Queen of Pop collection! Talk about a dream collaboration! Upon entering the doors, my eyes were automatically drawn to the pops of pinks, reds, and purples in the room. The curated collection by Poppy Delevingne was a dream come true, with the release of Jo Malone London’s first bubble bath! Three different scents including Velvet Rose & Oud, Nectarine Blossom & Honey (personal favorite), and Black Cedarwood & Juniper. The packaging is without a doubt what stood out for me - I loved how it was thoughtfully designed with playful patterns. Also lots of pink, which, as you can already tell, is my favorite color. The bathtub took me back to my childhood, memories flashed back as I remembered playing with my rubber duckies during bath time. I loved how each station was interactive and I successfully picked two ducks that scored me a couple of prizes! Afterwards we explored Los Angeles with the help of Poppy's guide of her favorite spots in the city. 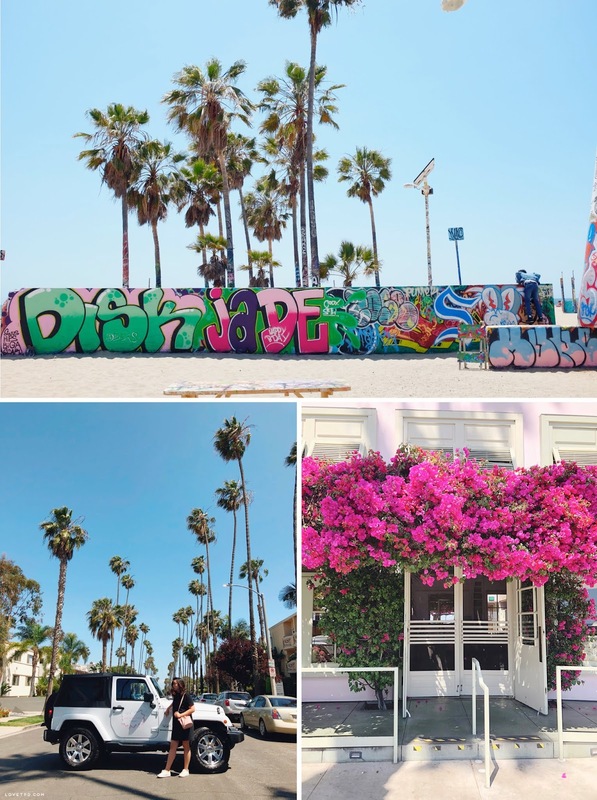 I headed to Venice Beach and with the help of our driver, spotted cascading blooms and found picture perfect spots. There’s no place like LA! Before heading to dinner I was surprised with Poppy’s Queen of Pop collection in my room next to a fun straw bag that I’ll be using this summer! The Blackberry & Bay candle smells divine - it's the perfect summer candle to light up during the day or night. The last night was spent in Malibu Beach at Nobu, with a drool worthy menu and endless drinks and laughter. I shyly chatted with Poppy Delevingne once I had the courage, and she is truly an ethereal beauty inside and out. 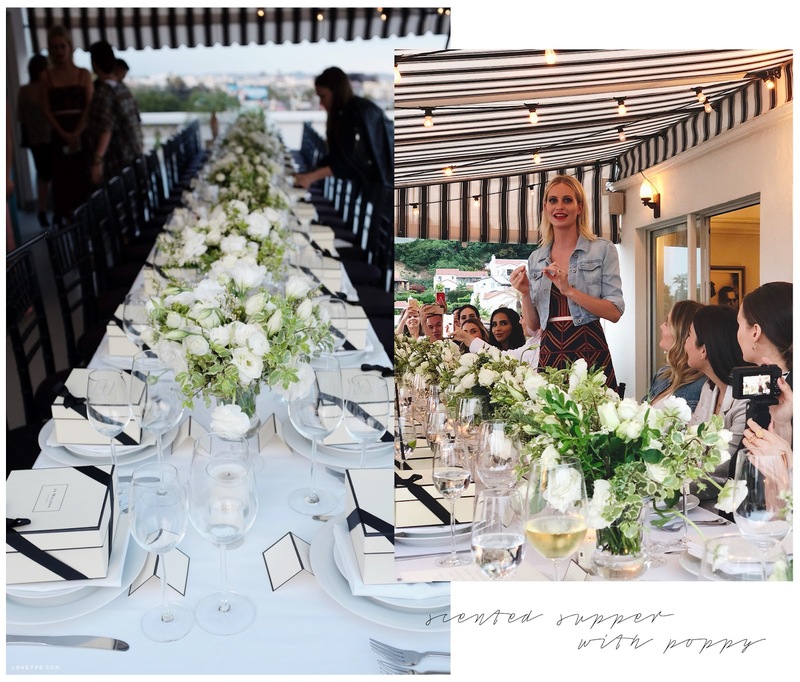 No one does a scented supper quite like Jo Malone London! A big thank you to Jo Malone London for a wonderful time in Los Angeles, one of my most memorable trips yet! Oh I am obsessed with Jo Malone!